Rory McIlroy wants to win the Open and prove to himself and others that his US Open victory was not a flash in the pan. Picture Fran Caffrey www.golffile.ieRory McIlroy is determined to win The Open and prove he’s no one-hit wonder. McIlroy said: “It would be my biggest achievement in golf. “To win that first Major was very important, and to move to World No. 1 in the middle of the year there was nice but to win the Open Championship and that second Major would definitely mean more to me than winning that first one. The last nine majors have gone to first-time winners and McIlroy is gunning to put an end to that streak. He said: “There has been talk of the parity now in golf with the fields are so much deeper and so much tighter, so it would be nice to break out of that bunch, and if I could do that this week it would be a great feeling. Rory McIlroy wants to make a habit of winning majors. Picture Fran Caffrey/www.golffile.ieRory McIlroy insists that he wants to win the career Grand Slam not just once but multiple times. And that’s why he’s fully focussed on adding to his major haul as he heads Ireland’s Big Four at Sandwich this week. Rory McIlroy has no plans to adapt his game to deal with rough weather in the Open. Photo Eoin Clarke/Golffile 2011Rory McIlroy got devoured by the conditions at Sandwich and insisted that he won’t change his American-style game to win an Open title. The Holywood star confessed that he’ll always be a fair-weather golfer and complained that he’s no fan of the the lottery of links golf when the wind howls and the rain lashes down. Rory McIlroy in action in practice on Monday. Picture via www.facebook.com/The-Open-ChampionshipRory McIlroy is bracing himself for the battle to become king of the jungle at Royal Lytham this week. Rory: "I feel ready to go, the game’s pretty good"
Fan favourite. 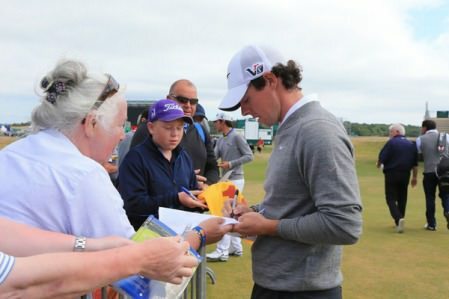 Rory McIlroy signs an autograph at Muirfield. Picture Fran Caffrey www.golffile.ieRory McIlroy insists he’s ready to snap out of his slump and battle for Open glory at Muirfield.